Looking for Package Deals to Puerto Rico? We have those too! Revel in the beauty of nature wherever you choose to golf in Puerto Rico. 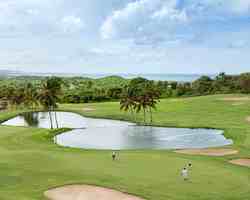 Wander past lush, tropical vegetation, winding rivers, rolling hills, breath-taking bluffs, and dazzling ocean views while you hone your skills at what many consider to be the best golfing destination in the Caribbean. With more than 15 world class courses, designed by Robert Trent Jones Sr., Rees Jones, Tom and George Fazio, and Greg Norman, you can play a new course every day for two weeks on end. Seem like paradise? You're not dreaming - you're in Puerto Rico. 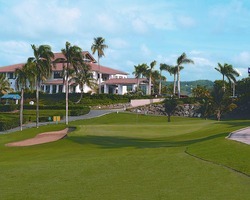 Designed by Arthur Hills, the luscious course features 18 holes and a par of 72. With unique elevation changes of more than 200 vertical feet, the course proves to be enjoyable and challenging for beginners and professionals alike. Experience the unique serenity of the golf course as you stroll along the rolling greens surrounded by magnificent ocean and rainforest views. *Course maintenance is 5/15-10/1. Course is closed on Mondays during this time. The course is closed for greens surface renovation 7/15/18-10/1/18.